How to use AppDynamics to monitor performance of a Java method? 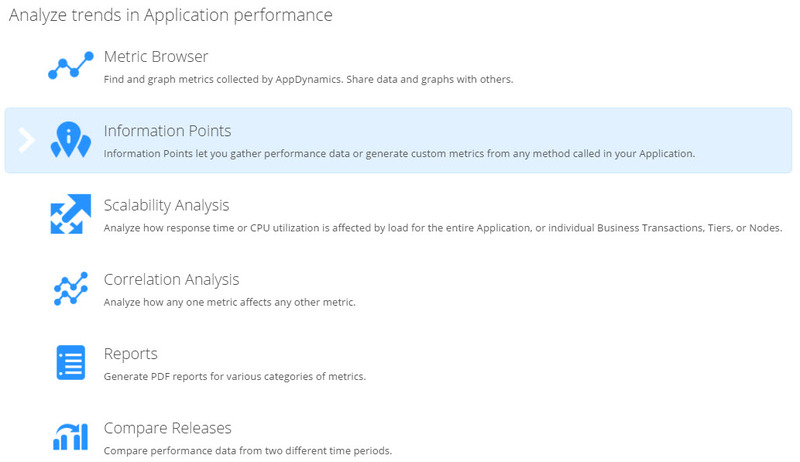 By default, AppDynamics captures tons of useful metrics from your java application. Average response time of your Applications, JDBC response times, Throughput, Heap and Garbage Collection Metrics etc. In addition, AppDynamics automatically captures Transaction Snapshots (that provide deep diagnostics) periodically and during slow response times. The snapshots will reveal the hotspots up to the method level. But at times, you may want to monitor a particular method for performance metrics. For example, you may want to know how often a method named ‘cancelOrder’ is called and how long it takes to process. For requirements like this, AppDynamics provides a neat way of instrumenting your java method – Information Points. To configure a new Information Point, navigate to Analyze -> Information Points. Click on the New button at the top. How to use AppDynamics to capture java method arguments and return values? One of the major uses of an APM such as AppDynamics is the ability to collect application data at method level. For example, let’s say you have a method named processOrder in your code that accepts OrderID and Username as parameters. What if you want to capture the Username as part of the performance metrics ? This can be extremely valuable, for instance, to identify which user could be submitting orders that are very slow to process. In AppDynamics, you can achieve this by using Data Collectors. In this blog post, let me show you how it is done. Method Data Collector – Captures method arguments and return values. Select Apply to new Business Transactions. If you don’t select this, you have to manually select the Business Transactions. Provide the method signature (identifying a method) by its fully qualified class name and method name. Note that you can also configure HTTP Data Collector if you wish you capture HTTP metadata such as URLs, Cookies and Header values. Ensured the application shows up in the controller UI. Note that we have not customized any monitoring elements yet. i.e whatever we are going to see is out-of-the box, which is one of the coolest things about AppDynamics. Let’s start. How to view the Flow Map of the Application ? Application flow map provides an excellent view of the data flow of the application. AppDynamics automatically tracks all the inbound and outbound calls of the instrumented application and attempts to draw this flow map. It is like an interactive Visio Diagram of the application infrastructure architecture that you did not create. (AppDynamics created it for you). Let’s take a look at the Flow Map of the sample application we have instrumented. So you have installed AppDynamics Controller, instrumented a simple Java Application and even viewed it from AppDynamics Controller UI. You have come a long way. Excellent work! In this blog post, I’ll take you a step further by showing you how to view critical Application Metrics in the UI. In order to get to see various monitoring metrics, let us use a more sophisticated application (one with a backend database). Fortunately a sample application is available at github specifically for this purpose. Kudos to the developers who made this available to all of us. The application is based on Docker (no surprise there) so you need to have Docker installed in your server that you are planning to use as the Application host. If you don’t want to go this route, simply instrument one of your applications (preferably in Dev environment). Here are the steps to install the docker based sample application.